Work in progress. Feel Free to contribute. 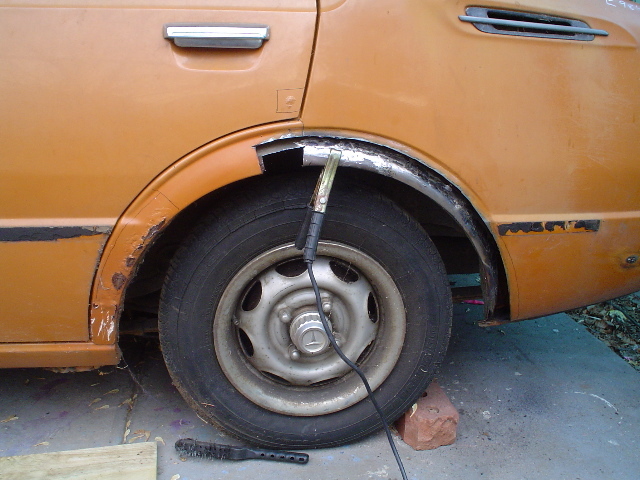 = Fixing Rust =I would recomend that anyone who is going to restore a Corrolla do a welding course first . They rust in the wheel arches[rear] and in the lower corners of the rear window . The roof gutters contain a body seam sealer as do some other areas of the body ie inside of the boot. Either due to the age of the cars and/or as a result of accident damage I believe that the seam sealer allows water to seep into areas of the body and then the car rusts in these areas .Thus when restoring your body remove the old seam sealer,repair the rustdamage and then replace the old seam sealer with new sealer .PLEASE BE CAREFUL with seam sealer and follow the safety directions when using these products as they are dangerous to your health . This is one of my rust repairs. TODO: Outline what sort of rust tends to form where in Corollas. This page was last modified on 4 February 2008, at 00:36.